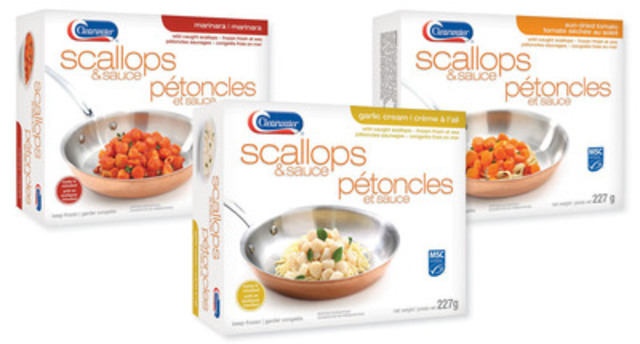 BEDFORD, NS, June 6, 2014 /CNW/ – Clearwater Seafoods’ new culinary-inspired Scallops & Sauce was named a best new product of the year at the 21st Canadian Grand Prix New Product Awards Gala held in Toronto. Clearwater Scallops & Sauce earned top honours in the best new Deli, Egg, Meat & Seafood product category. A panel of expert judges made up of respected journalists, chefs, consumers, R&D and marketing executives evaluated each product. Products were rigorously reviewed on five criteria: uniqueness and innovation; product characteristics; presentation and packaging; overall consumer value; and consumer acceptance. A second tier of juried review assessed the taste, nutritional value and pricing of the finalists. “We’re truly honoured to have been recognized by this esteemed organization and this panel of judges,” said Jeff Duffin, vice president global marketing, Clearwater Seafoods. “We have the pleasure of working with incredibly high-quality, wild and sustainable seafood in our innovation work – and our focus on culinary trends and ease of preparation reflects an understanding of what today’s consumers need,” Duffin continued. Clearwater’s Scallops & Sauce are sustainably certified by the Marine Stewardship Council. They’re made with frozen-at-sea Argentine scallops and coated with one of three signature sauces: Garlic Cream, Marinara and Sun-Dried Tomato. Consumers can prepare them on the stovetop or in the microwave and customize them with their own ingredients to make a fresh seafood meal in minutes. Scallops & Sauce were also recently recognized by Seafood International as one of the top new products of the year. Clearwater Seafoods Inc. (TSX:CLR) is one of North America’s largest vertically-integrated seafood companies and the largest holder of shellfish licenses and quotas in Canada. It is recognized globally for its superior quality, food safety, diversity of species and reliable worldwide delivery of premium wild, eco-certified seafood, including scallops, lobster, clams, coldwater shrimps and snow crab. As a leading harvester, processor and marketer of sustainably sourced seafood,Clearwater supplies its products to wholesalers, retailers and foodservice distributors throughout the world. Since its founding in 1976, Clearwater has invested in science, its people and technological innovation as well as resource ownership and management to sustain and grow its wild seafood resource. This commitment has allowed it to remain a leader in the global seafood market and in sustainable seafood excellence.